1. Prior to the start of the match, each team will provide their opponent a copy of their US Club Soccer Official Roster & copy of Game Day Roster. You may use the same roster for each game providing you have not added any players. If you have added players, an updated roster must be submitted to the league office, printed & given to opposing team showing the new players. The jersey numbers must be filled in. This roster is created by your club registrar on the US Club Soccer website (www.usclubsoccer.com) Players that are not playing or no longer with the team may be lined out on the roster. and (3) PSPL Game Roster and Referee Reports. You must check the box for any player using the player pass and an official US Club roster showing which team those players are rostered to must be given to the opposing team prior to the match. 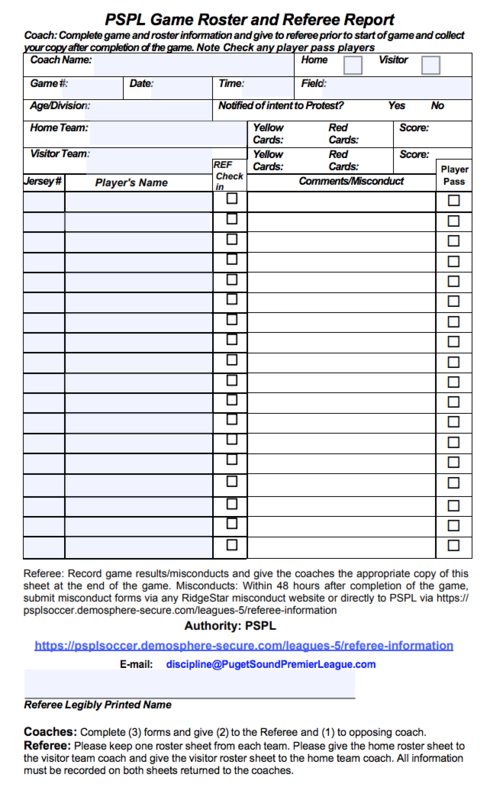 This form can be downloaded at www.psplsoccer.com. 3. Referee will check-in each team, matching US Club Soccer Player Passes to PSPL Game Roster Sheet and Referee Report. Referee will return the Player Passes to the teams after check-in. 4. At the conclusion of the match, the referee will return 2 completed and signed PSPL Game Roster sheet and Referee Report from both teams involved in the game. This should include match score, game misconduct, roster discrepancies and/or any other information the referee deems important. In the event of score discrepancies, the PSPL Game Roster sheet and Referee Report shall be considered the official record of the game. Referee will keep (1) completed PSPL Game Roster sheet and Referee Report from each team for his/her records. 5. Match results are to be reported by the winning team within 24 hours. In the event of a tie, both teams should report the score. This can be done online from your teams home page, or by phone. Dial the toll free number (866) 334-6294. When asked, say or enter the pin number of the league (this is NOT the same PIN number that you use to login to your team page) You will then be prompted to say or enter your game id number. The league PIN for reporting scores can be found on the Scores & Schedules page (see image below). You will then be told the division, teams playing, and field location - if this is the correct game, confirm by saying yes. When asked, say or enter the score for each team, then confirm. You can do more games in the same call, or just say goodbye when done.